The On 3 (originally conceived in 1970 by Milo Baughman) is an iconic midcentury modern chair design packing lots of dramatic punch in a thoughtfully minimal package. Its striking curvilinear frame is carved to form three, stout legs that support a supple upholstered seat and back filled with trillium and poly blend down. 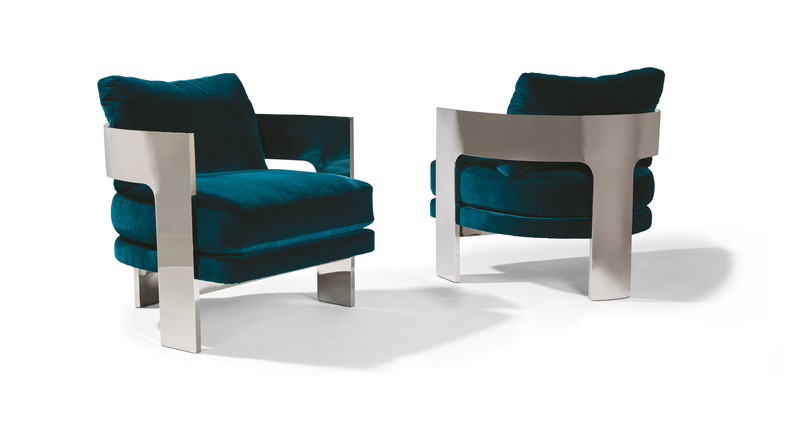 Baughman’s signature glamor is infused into the chair’s dramatic frame – available in either Walnut veneer, polished stainless steel, dark bronze or slip match Maple veneer in several wood finishes and paint colors. The On 3 lounge chair can be upholstered in any of Thayer Coggin’s in-house curated fabrics or leathers. For the maple wood base option select from any of our TC wood finishes. Shown with polished stainless steel arms and legs.